You are here: Home / Projects / Fundraising / Announcing this year’s Surf’s Up Beach Party! Announcing this year’s Surf’s Up Beach Party! Great news everybody! 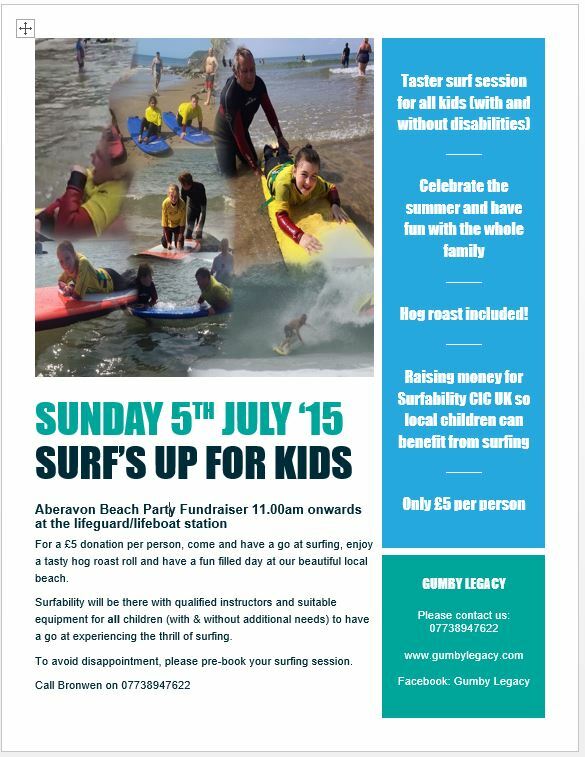 Proud to announce that we will be hosting another Surf’s Up fundraising event at Aberavon Lifeboat Station on Sunday 5th July 2015. It will start at 11.00am and continue throughout the day. After the first surfing event in September last year where we raised just over £1000, we have managed to subsidise ongoing blocks of surfing therapy to more than 30 children. Through continuous fundraising, we have also been able to donate £2500 to Surfability UK to put towards purchasing a much-needed vehicle which will mean that more children with disabilities will be able to access this incredible opportunity from beaches around the country. At the moment, sessions have been limited to Caswell Bay. One of the resounding successes of last year’s event was that children of all abilities were able to enjoy an activity together without the barriers of disability. All of the children who have so far had a block of surfing therapy, have reported increased confidence in their own abilities. We have recently invited siblings to surf together and the families have found it invaluable as a way of spending time together as a family. We aim to be able to continue providing children with this opportunity and hope that you will support us again at this years event. The hog roast is costing a small fortune so if anybody’s company is willing to sponsor/part sponsor/donate a couple of pounds(!) towards this wonderful event, it will be very much appreciated. Raffle prizes will also be gratefully received!